We warmly extend an invitation to all Australian Catholic Home Educating families to join us for our 13th annual Catholic homeschool camp!!. Two hours south of Brisbane, nine hours north of Sydney. Only three more months until our annual Catholic homeschool camp!! Excitement is building and preparations are gaining monumentum. Our annual camp is an integral part of our family life and the lives of many of our participating families. A time to develop and renew friendships, to gain support and to participate in the wider Catholic homeschooling community. At the core of our week is our shared Catholic Faith, our day begins with Mass (Extraordinary Rite), ends with the Rosary and Benediction and includes Spiritual Talks and the opportunity for Confession. This year Fr Terence Mary Naughtin is Camp Chaplain. 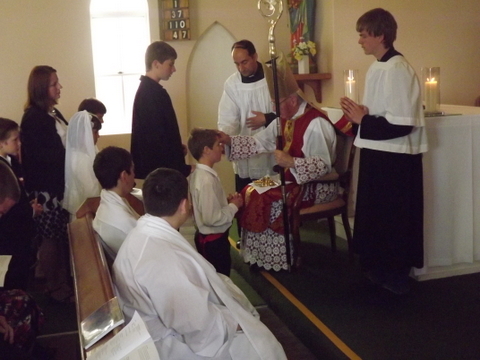 Bishop Geoffrey Jarrett of the Lismore diocese celebrates Mass(Novus Ordo Rite) on Tuesday offering the Sacraments of Confirmation and First Holy Communion. The camp is in walking distance to the beach and every day we enjoy swimming at one of the beautiful nearby North Coast’s beaches. Activities often enjoyed include icebreaker games, impromptu games of soccer, dancing, a sports day, sand castle building contest, a concert, and on the final night a bonfire. Each family is accommodated in their own dormitory and meals are fully catered.